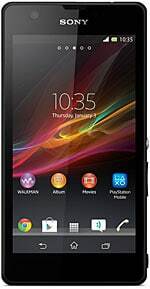 The Sony Xperia ZR, also known as the Xperia A SO-04E in Japan, is a waterproof LTE-enabled smartphone that runs Android 4.1 Jelly Bean. The high-end touchscreen device features a 4.55-inch 720 by 1280 display and is powered by a 1.5GHz quad-core Qualcomm processor. The ZR comes with Sony’s “One-touch” feature, allowing music, photos, and videos to be shared with other devices via NFC. The phone is IP55 and IP58 compliant, meaning that it is dustproof and resistant to low-pressure water jets, as well as allowing the device to be submerged in up to 1.5m of fresh water for up to 30 minutes. The phone comes with 13 megapixel camera which can be used to record full HD 1080p video underwater. Announced in May 2013, the Xperia ZR will be available from the second quarter. It has been reported that the device will not be available in the UK, France, or Germany.